During the mid-1950s, I was a teenager and worked for one summer at the Imperial Bank at Yonge and Bloor Streets. Each day, on my lunch hour, if I strolled south on Yonge Street, I passed by Stollerys and gazed in the display windows. However, I never ventured inside the store as I knew that the prices were beyond my means. My employment at the bank was $28 per week. At the time, I knew nothing about Stollerys’ long and distinguished history in the city of Toronto’s retail trade. Frank Stollery was born in Yorkville in 1879, during the days when it was a semi-rural community, surrounded by fields and farms. When he was a boy, residents of Yorkville journeyed to Toronto via the horse-drawn streetcar service on Yonge Street, its terminal being King Street near the St. Lawrence Market. Frank quit school when he was 14, which was not uncommon in that day. He found employment in a shop where he learned the skills required to cut men’s shirts and ties. Being adventurous, he relocated to Montreal and by age 20 was a foreman in a Montreal clothing factory, earning $12 per week. At age 21, he joined the Royal Canadian Regiment, but remained in service only a year. Returning to Toronto in 1901, he borrowed $1000 from his father and opened a haberdashery shop on Yonge Street, south of Bloor. A few years later, he relocated his business to the southwest corner of Bloor and Yonge Streets (1 Bloor Street West). He rented the property, but in 1928, purchased the site and commenced renovations. He also purchased the building to the south of his shop and incorporated it into the store. However, in 1929, the City expropriated 20 feet on the north side of his shop to widen Bloor Street. This essentially created a situation in which Stollerys and many of the other businesses on the south side of Bloor Street were unable to operate, until the widening had been completed. Undaunted, Stollery demolished a portion of his shop behind the hoarding, and began the construction of a new structure. However, he continued operating in the remainder of the premises until the new building was completed. The attractive new structure opened about 1930 or 1931. It possessed two-storeys, with large display windows on the ground floor. The windows on the second floor were topped with rounded Roman arches, and the roof possessed red tiles. The decorative stone carvings on the facade reflected Art Deco, with modern Italian trends. The store’s display windows became famous as they were meticulously arranged to feature the most up-to-date styles of expensive suits, jackets, raincoats, ties, shirts, and pyjamas. Frank retired in 1968, selling the business to his son Arthur, and Ed Whaley, each owning 50 percent of the enterprise. Whaley managed the store, while Frank remained a silent partner. Whaley renovated the store and also leased the building to the immediate south, including it as part of the shop. When the business was at its peak in the 1970s and 1980s, it employed 100 people and it was assets were valued at $30 million. Frank Stollery died on January 1, 1971 at his home at 32 Teddington Park Avenue, near Yonge Street, seven blocks north of Lawrence Avenue. In the years ahead, due to internal business problems, the store became neglected, the display windows becoming rather shoddy. By the second decade of the 21at century, the value of the land where the shop was located was astronomical. It was sold and quickly demolished in 2015, its demolition accomplished within a single weekend. The camera is pointed at the southwest corner of Bloor and Yonge Streets in 1912. The Frank Stollery men’s shop is on the corner. The photo provides a good view of the west side of Yonge Street, south of Bloor in the second decade of the 20th century. Toronto Archives, F 1231, Item 1691. Frank Stollery’s shop in 1922, the north facade of the premises facing Bloor Street. The windows have awnings that sheltered potential customers from the summer sun. Sadly, few modern stores offer this feature. Toronto Archives, F 1034, item 816. Stollery’s in 1923, shadows indicating that it was taken in the morning. The policeman operates a traffic sign as there was no stop lights. Toronto Archives, F1231, Item 2089. Stollery’s store in 1928, when the shop to the south of it was being incorporated. To accomplish this, half of the old store was demolished. The photo also contains Peter Witt streetcars that began service in Toronto in 1921. Toronto Archives, F1244, item 7393. The camera is pointed toward the northwest corner of Yonge and Bloor in the 1970s. This is the building that opened in 1930-1931. The red-tiled roof, second-storey rounded windows and the ground-floor display windows are visible. Toronto Archives, F124, File 2, Item 109. Gazing south on Yonge Street from Bloor Street in the 1980s. A third storey has been added, its facades constructed of glass. Toronto Archives, S 1465, fl0614, Item 002. Photograph of the southwest corner of Yonge and Bloor in 2013. The camera looks south on Yonge. Frank Stollery’s store in 2013. 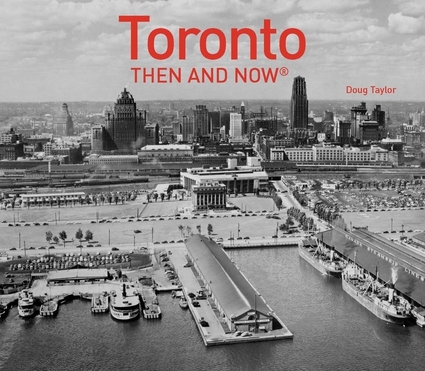 Another book on theatres, published by Dundurn Press, is entitled, “Toronto’s Movie Theatres of Yesteryear—Brought Back to Thrill You Again.” It explores 81 theatres and contains over 125 archival photographs, with interesting anecdotes about these grand old theatres and their fascinating histories. The first time I heard the shrieks and laughter from the swimming pools near High Park was on a June day in the 1940s. My family was attending a Sunday school picnic in the park, and the sky on that Saturday morning was crystal clear, a hint of the afternoon’s heat already evident in the air. I vividly remember the scorching sunshine that day, even after all these years, as it was one of the few times in my life that I received a painful sunburn. Alas, despite my imaginary bravado, I was confined to the wading pool inside High Park. Later in the day, I won a book as a prize in the “sack race,” but it did not compensate for being too young to visit the swimming pools. When I was a few years older, I learned that they were the “High Park Mineral Baths,” often referred to as the “Minnies.” Located on the north side of Bloor Street West, they were between Quebec and Glendenan Avenues, across from Toronto’s largest park—High Park. The swimming pools were important during the summer months in Toronto, particularly before the popular pool at Sunnyside Beach opened in 1921. The site where the mineral baths were located was purchased by George J. Leger in 1889. He was a retired businessman and politician, and when he bought the property, its northern boundary was on Gothic Avenue, its southern boundary on Bloor Street. He built a mansion, carriage house, and stable on the site, its postal address 32 Gothic Avenue. Leger named his mansion “Glandeboye,” after a place in Ireland that he remembered fondly. The view from the house was magnificent as it was on a hill, which on its western side overlooked the deep ravine that led down to Grenadier Pond. It was a wide ravine that was eventually filled in to allow the Bloor streetcar line to extend westward. In the late decades of the 19th century, the area to the north of High Park remained undeveloped, and was considered a rural district to the northwest of the city. In 1905, George Leger sold the house and land to Dr. William McCormick from Bellevue, Ontario. Dr. McCormick’s wife was also a doctor, and together they renovated the mansion to create the High Park Sanatorium. It officially opened on June 27, 1907, and when full, it accommodated about 20 patient. The facility was associated with Kellogg’s Battle Creek Sanatorium in Michigan. Dr. Harvey Kellogg, the founder of the institution, was the creator of the breakfast cereal, “corn flakes.” Both sanatoriums treated diseases of the nervous system and promoted a healthy life style, stressing daily exercise and proper diet. In 1913, to assist his patients, Dr. McCormick built an outdoor swimming pool on the southern portion of his property, close to Bloor Street, believing that swimming in it would be therapeutic. One research source states that the water for the swimming pool was likely from Wendigo Creek, which emptied into Grenadier Pond. However, another source states that the water was derived from artesian wells, one of them 80 feet deep and the other 650 feet in depth. Whatever the source, the water was cold and possessed a beneficial mineral content. It was said that the water was heated to 72 degrees Fahrenheit to accommodate the bathers. The pool’s shape was an elongated rectangle, and it was for the exclusive use of the patients of the sanatorium and their families. In 1914, a year after the mineral baths were opened, the Toronto Civic Railway Company laid a single-track streetcar line along Bloor Street, westward from Dundas Street to Gothic Avenue. The High Park Mineral Baths were now at the terminus of the line, making them easily accessible by public transportation for residents across the city. The pool was enlarged and in 1915 and opened to the public. Difference hours were reserved for men, women, and mixed bathing. During the summer months, the pool was open from 9 am to 9 pm. By 1917, because of the popularity of the mineral baths, a second pool was built, its dimensions about 50’ by 100’. The old diving tower was replaced by one that had diving boards on different levels and several slides for descending into the water. Because of the increase in the amount of water needed for the pools, the natural sources became insufficient, and the facility commenced using water from the City of Toronto. During the 1920s, the mineral baths were among the most highly attended swimming facilities in the city. In 1924, they hosted the Olympic Swimming Trials. During the 1940s and 1950s, the mansion on the hill overlooking the pools was the Strathcona Hospital, which served as a private maternity hospital. However, in the 1960s, plans commenced for the Bloor/Danforth subway. To accommodate the subway line, a portion of the land on the southwest side of the mineral baths was needed. As a result, the pools closed in 1962. I never had an opportunity to swim in the High Park Mineral Baths, but as a boy, I visited Crang’s Swimming Pool, near St. Clair and Oakwood Avenues. Its source of water was a branch of Garrison Creek. I also can recall a swimming pool named “Pelmo Park,” which was on Jane Street near Church Avenue. As a teenager, I also swam in the heated pool beside Sunnyside Beach. Because Toronto’s summers do not linger long on the calendar, summer swimming was a treasured treat of childhood. In the 21st century, the magnificent mansion at 32 Gothic Avenue was renovated to create a luxury condominium named “Gothic Heritage Estates.” The three-storey building contains 7 spacious residential units. Sources for this post: torontoist.com—http://losttoronto2—www.highparknature.org—www.visualreferencelibrary.ca—http”//jamesellisarchitect.wordpress. The archival photos were also extremely helpful in determining the history of the mineral baths. Location of the High Park Mineral Baths. The High Park Mineral Baths in 1913, when the pool was used exclusively by the patients of the sanatorium and their families. Photo from Toronto Archives, F1244, Item 8157. The first pool built on the sanatorium site. In the background, landfill is being dumped to fill in the ravine to allow Bloor Street to be extended westward. Toronto Archives, F1231, It. 292. Bloor Street near High Park in 1914. This photo illustrates how rural the area was to the north of High Park in the early decades of the 20th century. Toronto Archives, F1244, It. 0018. The minerals baths on August 29, 1915, after the original pool was enlarged. The mansion that George Leger built in 1889, which was sold to Dr. McCormick, can be seen on the hill, in the background. Toronto Archives F1548, s0393, Item 12314. A view of the swimming pool in 1916. Toronto Public Library, r-2103. The High Park Mineral Baths in 1916, Toronto Public Library, r-2085. A view of the pools on July 6, 1917, looking west from the east side. Toronto Archives, Fonds 200, S. 373, Item 489. View looking north from Bloor Street in 1920. Visible are the swimming pools and the High Park Sanatorium on the hill. Toronto Public Library. r-4647. Gazing north from Bloor Street West in 1920. The two buildings on the right-hand side of the photo remain in existence today. The Bloor subway was built behind these buildings. Photo from the Toronto Public Library, r-2086. View of the pools in 1950, looking south from the hill where the sanatorium was once located. Bloor Street and the northern edge of High Park are in the background. Toronto Public Library, r-2104. High Park Mineral Baths in 1953, Toronto Public Library, r-2117. Gazing north to the house at 32 Gothic Avenue in 1953. Toronto Public Library, r-3796. View in 2016 of Bloor Street West, where the High Park Mineral Baths were located. View of the north side of Bloor Street, opposite High Park in 1920 (left) and in 2016 (right). The “Gothic Heritage Estates” today, at 32 Gothic Avenue. Wood trim on the east side of the home of Dr. William McCormick, which was renovated to create a sanatorium. Verandas on the south and east sides of the McCormick house.